Featuring Lacus Clyne! I really like this pose of her. It shows the other side of her, ya noe wad i mean? Aniways, this background, i just did watever i could do. I filtered it, i distort it, i flipped here and there, and, lol, basically playing around but am glad cos the product is so awesome. The image extraction was done by my sister, angel princess. Her id here should be nur_sheila. Credits go to her on her wonderful extraction. 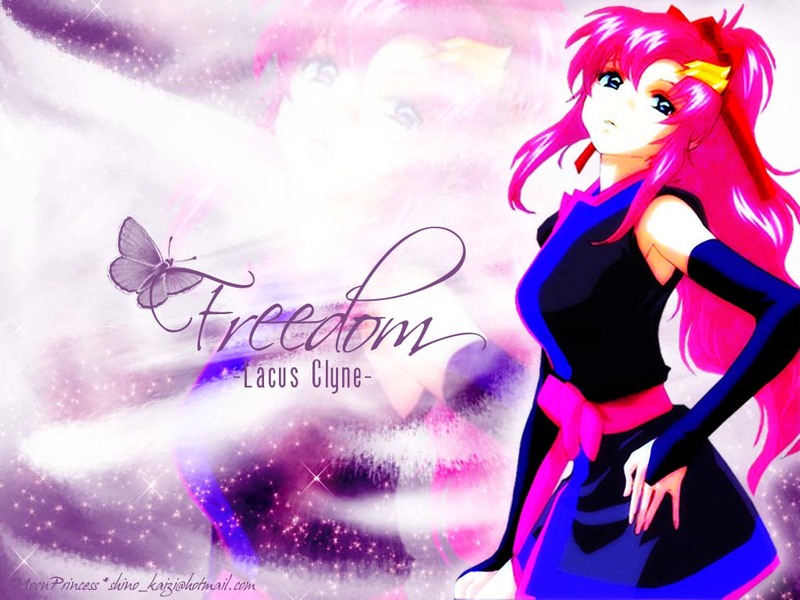 (She's a Lacus fan btw) Well, hope you guys liem this! Hey, of course I really like this. super masterpiece. I love it. Thanks for posting up here. Same as the comment for the other wall "Cherish" you posted. The background is nice, but Lacus seems a bit blurry. Anyway, keep it up! I think that you did a good job. I like this pic with Lacus and i think that it fit with background. Lacus is a bit blurry but i liek it overall. nice background. keep it up. Oh! Cagalli, this is a good one! I like the butterfly next to freedom..and your right about Lacus..she looks like she's more carefree or something. Again, verry pritty, and *favies!*. nice... i like the background and the butterfly on the text^^ Lacus looks a little neon tho... kinda hard on the eyes o.o but good job nonetheless!! Lacus looks really really beautiful in this wall... the pink bg looks great!! This is my favorite outfit that Lacus wears, sort of a clash between traditional apparel, with the new type. The semi-seductive pose, as well as the soft backround, make for a great wallpaper. nice stand alone piece of Lacus Clyne. I like this custume of hers second only to her standard one that she wears (for performance and audiances). Not sure, but this is the one she wears while shoping with Meyin (sp?) and the boys right? Lacus ! She looks so cool there ! !